Starting tomorrow, November 18, the County of Los Angeles Department of Animal Care and Control (DACC) will begin field enforcement efforts in the unincorporated areas of Los Angeles County to ensure residents’ compliance with laws regarding pet licensing, vaccinations, microchipping and spay/neuter. However, there will be a grace period for the altering and microchipping of cats. DACC officers will visit the unincorporated areas of Cerritos (90703), Compton (90220, 90221 and 90222), Los Angeles County (90059) and Long Beach (90808). The City of Long Beach has its own regulations regarding household pets; Licensing and vaccinations are both mandatory, and spaying and neutering cats and most dogs has been mandatory since October 1. On October 20, the LA County Board of Supervisors approved amendments to its ordinance to require spaying or neutering and microchipping cats. This legislation becomes effective Friday, November 20. Yet, as previously stated, DACC is giving cat owners a grace period to come into compliance and will not begin enforcing the ordinance until March 1, 2016. Microchipping of cats and dogs, however, is optional in Long Beach, but residents of unincorporated Long Beach are under DACC’s jurisdiction. Dog and cat licenses and especially microchips assist animal control in finding the owner of a lost pet; licensing also helps to document which animals have been vaccinated, thus helping to prevent the contraction and spread of rabies. 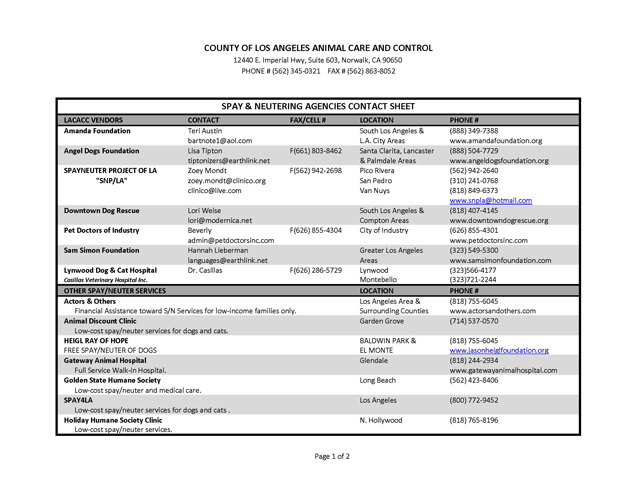 California law requires that all dogs over the age of 4 months be licensed and vaccinated against rabies, and L.A. County requires the same for all cats. As of January 1, 2014, puppies may be vaccinated at 3 months but are not required to be vaccinated until 4 months. Pet owners must be in compliance with licensing, spay/neuter, and microchipping if they reside in unincorporated areas of L.A. County or within cities that contract with the county and have adopted the County’s Title 10 ordinance. Residents not in compliance will be subject to license fees, delinquency charges and a $40 field enforcement fee to offset the cost of the Department’s field services. In order to avoid penalties, particularly during this time if you live in any of these areas, be sure your pet is licensed, vaccinated, microchipped, and spayed or neutered. License information and a link to online registration are available here. Residents can obtain new licenses or renew current ones either online or at the local branch of L.A. County’s animal care center. 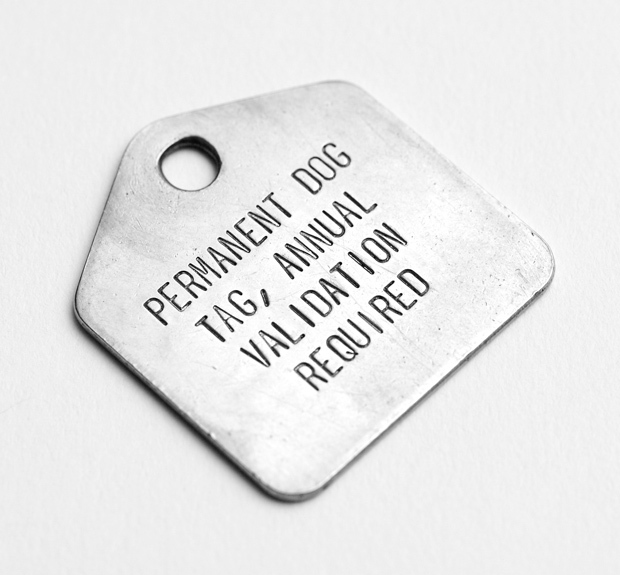 If a license is delinquent, it must be renewed at a county animal care center or by mail, with applicable penalties included. City of Long Beach: Scherer Park, 4600 Long Beach Boulevard, Long Beach, Thursday, 4:00PM–6:00PM, November 19, December 3 and December 17. Check Long Beach Animal Care Services’ home page for next year’s schedule after these dates have passed. Non-residents of Long Beach are also welcome. Los Angeles County: The County offers discount vouchers to senior and low-income residents of the areas described in the article. An application is available here. The PURRfect Fix program makes $50 vouchers available to offset the cost of spaying and neutering cats. In some instances, the voucher will cover the entire cost of surgery. Details and providers listed here. For L.A. County unincorporated and contract city residents only. DACC also partners with providers to conduct low-cost spay and neuter mobile clinics for dogs and cats at our County animal care centers (as space allows) and other locations. Fill out the form on this page or call (562) 345-0321 for information. Fix Long Beach offers free spay’/neuter procedures to low-income Long Beach residents only. Residents may apply for an appointment on the website or come to any scheduled clinic for a cat or dog voucher. Click the link for details or visit the Facebook page. At each of Fix Long Beach’s clinics, low-cost vaccines and free microchips are offered. 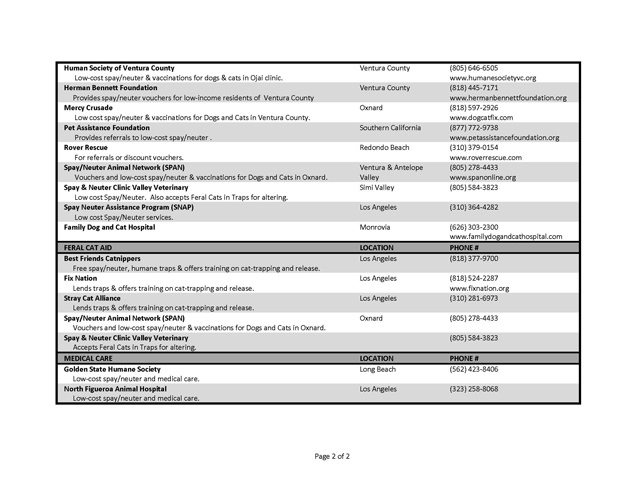 Below is a listing of L.A. County/Long Beach spay/neuter assistance organizations and low-cost clinics. This story was updated on 11/19/15 at 5:00PM, with information regarding the county’s grace period for the microchipping of cats.